Tuna, tarragon and egg: what's not to love about this elegant Nicoise sandwich? It’s a drizzly morning. The gray exterior walls of Lush match the sky. Inside those walls, a bouyant mix of music plays as neighbors sit at the bar and surrounding tables, sipping coffee, catching up on the morning news and with each other. The bartender knows every face that walks in the door and is quick with a drink or coffee refill. It could be any other coffee shop in the cities were it not for the beckoning dance floor behind the bar. Lush continues to twist and turn to be all things for all of their customers, and one of those things is to continue to ramp up the quality of the food they serve (as the website states, this is Lush Food Bar, after all). A couple of months ago, they added Patrick Waller to the kitchen staff. He’s running the kitchen after spending time on the line at Bryant Lake Bowl and Café Barbette. While none of the food is venturing into haute cuisine territory–this is a comfortable neighborhood joint most nights–the new menu, especially the brunch, has been elevated. The truffle scramble arrives full of pungent black truffles. The small curd scrambled eggs are flecked in an insane amount of truffles for the $11 price tag, spooned over grilled New French Bakery baguette. 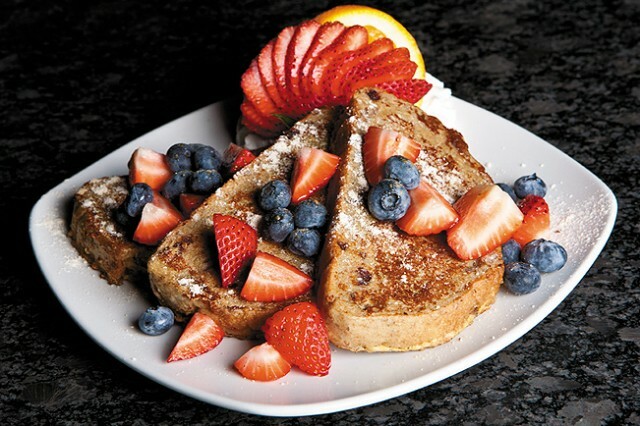 For those who like their breakfast a little sweet there’s the French toast. Cranberry pecan bread is thickly sliced, dipped in eggs and milk before a quick fry on the griddle. The result is a pleasantly chewy bread, with the tart pop of the fruits balancing the sweetness while the nuts add texture and a meatiness to the bread. Waller explained that he likes the bread to remain as fat as it is because when he was younger, his mom made French toast out of thin Wonderbread, soaked into oblivious mush. The entire dish is dusted with a raw sugar powder that he makes in the back and sprinkled with an ample amount of strawberries and blueberries. Served along the side is a pitcher of real maple syrup. 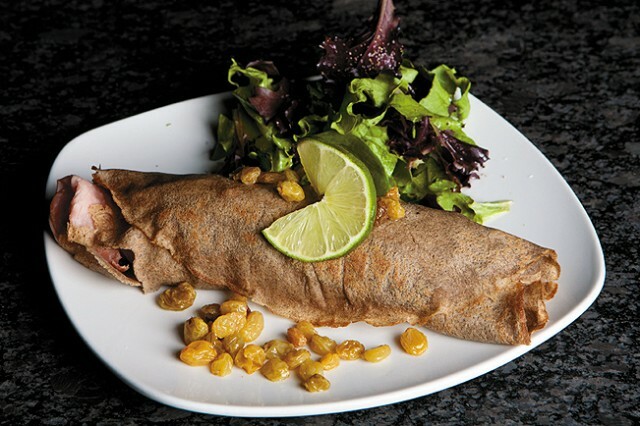 On the more savory side was a buckwheat crepe stuffed with ham and gooey brie cheese served alongside a beautiful, lightly dressed mixed green salad with a poppyseed dressing for $10. Unfortunately, we found the crepe and ham were a bit dry. 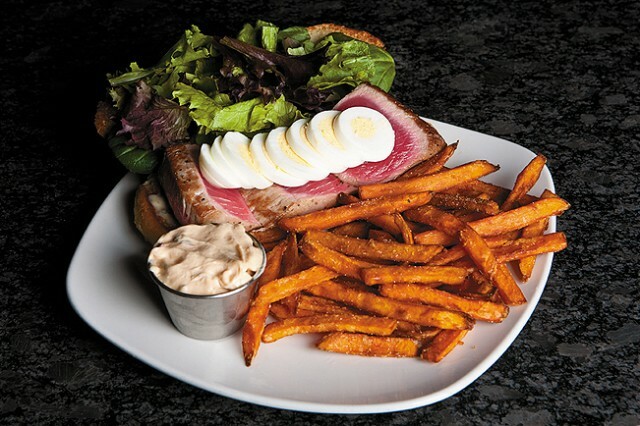 For the lunch side of brunch, we were also served the Nicoise sandwich. On a fresh demi-baguette arrived fat hunks of beautifully rare tuna atop a tarragon aioli that tasted like a creamy, bright lick of spring. The tuna was perfect – simply seasoned with salt and pepper and wonderfully meaty. Thinly sliced hardboiled egg fanned out over the fish made it an extra hearty sandwich for only $13. With the sandwich we got an order of the sweet potato fries, a fantastic mix of sweet and salty that almost didn’t need the mildly chipotle-seasoned mayo sauce on the side. Cranberry and nut studded French Toast served with as much real maple syrup as you'd like. While my morning visit was non-alcoholic, the spiked coffee drinks looked appealing, especially the Brown Cow cappuccino of crème de cacao, Kahlua, milk and espresso: dessert, happy hour and breakfast – all in one beverage! With an ample amount of comfortable seating, huge windows and patio, this would be an ideal breakfast spot any day of the week.